Record Company – Sony Music Direct (Japan) Inc. 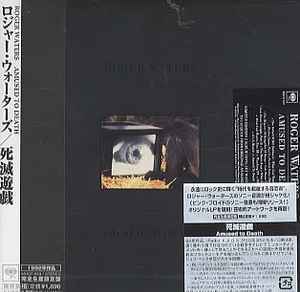 Manufactured By – Sony Music Direct (Japan) Inc. Published By – Roger Waters Music Overseas Ltd. Published By – Pink Floyd Music Publishing Ltd.
℗&©1992 Sony Music Entertainment Inc. Manufactured by Sony Music Direct (Japan) Inc. The Billiard Room, Olympic Studios, CTS Studios, Angel Studios, Abbey Road Studios, London; Compass Point Studios, Nassau; Devonshire Studios, Ameraycan Studios, Evergreen Recording, Johnny Yuma Recording, Los Angeles. Devonshire Audio & Visual Studios, Burbank. Jeff Beck appears courtesy of Epic Records. Rita Coolidge appears courtesy of Attic Productions Ltd./Canada. N'Dea Davenport appears courtesy of Delicious Vinyl/Atlantic Recording Corp.
Don Henley appears courtesy of Geffen Records. Brian Macleod appears courtesy of MCA Records, Inc.
John Patitucci appears courtesy of GRP Records. The gorillas appear courtesy of The Howletts and Port Lympne Foundation. Special Thanks: The late Tom Bromley, Rick Chertoff, Flea, Don Ienner, Tony Kaye, Andrew Locke, Andy & Lynn Quigley, Tony Russell, Suzanne Taylor, Michael and all the staff at the Sunset Marquis. Released in CD sized Hardback Stickered Picture Sleeve album replica with obi-strip, printed reproduction of vinyl labels, 12-Page lyrics-book reproduction, printed inner-sleeve and concertina French fold-out b&w insert with commentary[解説] by 宮部知彦[Tomohiko Miyabe] from 1992, and by 鬼形 智 Satoshi ONIKATA from 2005, lyrics in both English and Japanese which translated[対訳] by 山本悦子 and イーリファー・コダマ／UNICUL - tracks as above.